Lawn care products cover a wide range of needs, resulting in costs that can vary across the lawn care market. The popularity of lawn care as a hobby among home owners spawned a high volume of lawn care products intended to be used by everyday individuals with no landscape training. There are several categories of lawn care products, each targeting a different need. Budget weed killers that target less dangerous species in a less significant formulation can be had for very few dollars per bottle or bag. Weed killers are sold most commonly as sprays or pellet formulations to be dispensed over a lawn through a spreader. The categories each contain several subcategories that may cater to a specific species of plant or insect of concern in a lawn. Weed control is a concern for host homeowners with any significant amount of property. There are many spray designed to control growth of common weeds such as dandelions, crabgrass and clover, offering the consumer many choices in price and enhancements. The most expensive sprays used for weed control can cost well over $20 for a bottle with several applications. What type of weeds is causing the problem in the lawn? Certain weed control products may not be applicable to the species bothering a lawn. How severe is the problem? Some manufacturers of weed control products will release, among their weed control solutions, a product generically known as “kill all”. The most serious lawn care products for weed control are only intended for use in instances of a severe weed problem. Over killing the weeds can result in toxic runoff into other areas of the lawn. Is the weed control product safe on grass? Where there is a weed problem in the grass in addition to mulch beds or gardens, multiple products may need to be used for control. Some weed control products are safe to use in the grass without killing off portions of the lawn. Weed control agents that are not safe for grass will result in dead grass and permanent damage to sensitive plants. Keeping bugs away from sensitive plants in a lawn is another target of many lawn care products. Insect damage can be unattractive and widespread through a property if not contained in its early stages. Many of the major lawn treatment companies advertise guaranteed services for the elimination of populations of lawn killing bugs. Realistically, bug problems can arise at any time and must be handled with a swift hand for those who cherish the appearance of their landscape. As in the products designed for killing weeds, pest control products run a wide range in pricing. Simple formulas as sprays or pellets intended to kill damaging insects run from very few dollars to the twenty dollar range. Serious concoctions advertised as commercial or industrial may cost far more, and may require the use of additional equipment for application. 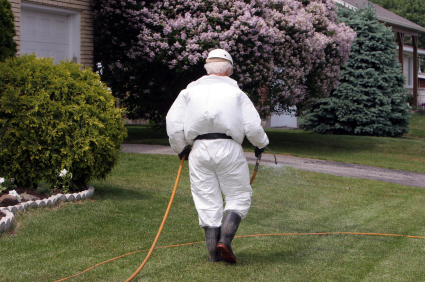 When considering which pest control, homeowners must first determine whether they are facing insects or other pests. Moles and other small rodents can cause problems in a garden as easily as a colony of bugs. There are treatments sold for the control of each lawn pest, with ingredients to target the eradication of the creature or prevent activity. Moles – Commonly a problem in gardens, moles thrive due to their desire to burrow in quality soil and feed on the types of insects that live in garden environments. There are many products on the market to kill or prevent moles, most of which are manufactured in the form of a poison or trap. Research seems to indicate trapping is the only surefire way to control a mole population. Grubs – Grubs are actually beetles in the larva stage. Feeding on the roots of many grass plants, grubs are most destructive in mid-to-late summer when they can kill a plant by its roots. Grubs must be controlled at the onset of the problem to avoid extensive destruction to a lawn. Grub treatments come as pellets or spray and are applied to the ground, where the creatures live before growing into their adult stage and emerging as beetles. Mites – Not generally recognized by the layperson as a threat to a lawn, there are several species of mites that actually attack grasses. Mites feed on all types of plants, though some species prefer clover and other garden plants. Mites are usually treated with a spray that is applied to the affected plants or soil surrounding the plants. Ants, Aphids, Caterpillars and Various Worms – Severe infestations of a number of other insects and bugs, such as ants and aphids, can pose serious problems when not controlled. Though many species of insect will inhabit a yard as its natural environment, populations that begin to overtake their reasonable confines are a signal that treatment is needed. Variations on spray, soil treatment and pellets are all used to control large groups of insects that dwell on or near the ground. Lawn care products designed to eradicate weeds or infestations of lawn pests are the last line of defense for the homeowner who is attempting to avoid professional intervention. In instances where the problem has grown out of control, contacting a specialist may help to prevent increased damage as the creatures settle in, withstanding the products being used for their control. Often, paying for a treatment from a commercial lawn care company is a less expensive option than futilely resisting an infestation to the point that the animals have become embedded and habitual in the lawn. Should I not first wait to see some signs of a problem (which may never materialize) before I decide to spray? I also believe that this spraying should be done late July or August and not now. The cost of $169 sounds unreasonable to me? Hi Sol, almost every lawn has some grubs. The problem is when you have more than 10 per square foot, They eat the root system between the soil layer and the turf. The grubs will eat so much of this that the grass will die and you can roll it up like sod. One or two grubs per sq foot will not harm your lawn and will recover just fine. Yes June beetles do lay eggs on the lawn. The lawn company you talked with did not explain the reasoning to you properly. Grub treatments in June are preventive applications. Prices for grub applications are based on the amount of lawn to be treated. Here in the Chicago area prices range anywhere from $69.00 up to $135.00 per 10,000 sq ft of lawn. The application in June needs to be watered in to get down to the area where the grubs live to control them when they are still small. The grub application will be absorbed by the lawn roots so when the grubs eat the roots they die off. August applications are normally a short lived contact application that will nee to be watered in also to get down to the grubs to do its job properly. Either application will work. Waiting until you see grub damage will be in late August or September. Grubs can do a large amount of damage very quickly, you may see your lawn looking great one day and the next 1/4-1/2 your lawn may be dead in a the next day if the grub population is very high. Weather conditions also play a large part of how the grub population is from one year to the next. The cost to repair grub damage is usually more than the preventive application is. If you see a lot of grub damage in your neighbors lawns it probably is wise to to have a grub application done to your lawn. Since grubs will live over winter about 4 feet below the soil surface and reemerge the following spring it is wise to apply a grub treatment the following year also. Hope this helps.